BEDFORD - Bobby Henline will be the first to tell you that he should've died in Iraq in 2007. “I was burnt over 38 percent of my body," Henline said. "Doctors said there's no medical explanation for why I'm alive." Ten years ago, the Humvee Henline was riding in hit a roadside bomb. The blast from the explosion killed four other men inside inside the vehicle and left Henline severely burned. It was his fourth tour in Iraq, his thirteenth year in the military. "If I was one of the guys that didn't make it, what I want for the guy that did, of course I would want them to live the life to the fullest," Henline said. For the last decade, the father of four has tried to find out how to do that. 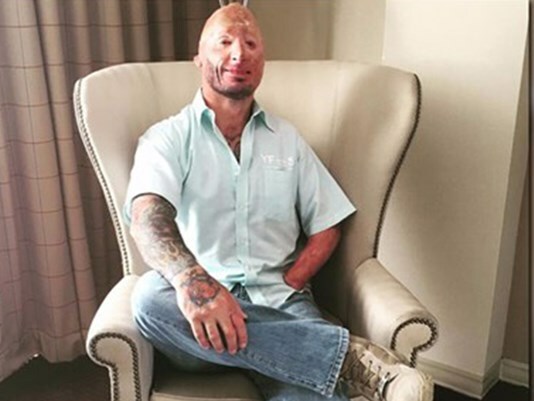 "I've got to teach them the burn survivor wave," Henline said as he waved both arms above his head. "It's like when you buy a Jeep you learn the Jeep wave. The day you get burned, you learn the burn wave. It's like, 'ahhh!'"